On the Patient menu, under General, click (or tap) Document Manager. The patient's Document Manager page opens. On a patient's Document Manager page, click (or tap) Upload. The Upload Files dialog box appears. Drag a file from another open window to the area indicated in the dialog box, or click (or tap) Browse to locate the appropriate file. The supported file types are as follows: .pdf, .jpg (.jpeg), .png, .gif, .doc, .docx, .ppt, .pptx, .xls, .xlsx, .msg, and .html. You cannnot upload files with names that contain the following characters: /, \, :, *, ?, ", <, >, or |. 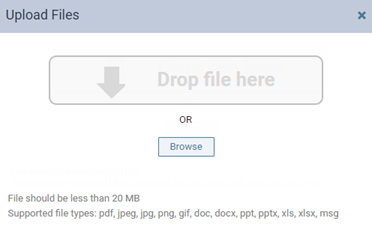 The maximum file size for files that you want to upload to the Document Manager is 20MB. Files pass through an anti-virus scanner upon being uploaded. Repeat step 2 for any other documents that you want to upload. The selected files are listed in the dialog box. 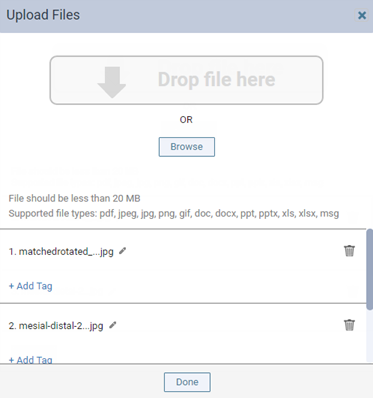 To change the name of the uploaded document or image in the document manager, click (or tap) the Edit button next to the name, and then enter a new name in the field that appears. To remove any item so that it does not get added to the patient's record, click (or tap) that item's Remove button . Then, click (or tap) Remove on the confirmation message that appears. You can add tags to any item to categorize or classify the document or image being uploaded. Click (or tap) an item's + Add Tag link. Begin typing in the search box that appears. Continue typing as needed to narrow the results list. Then, either select the desired tag or the '[text]' (Create) option (where [text] represents the text that you have typed) to add a new tag (which can be used to tag any other patient's uploads, too). Repeat this process as needed to add other tags to the document or image. In the document manager, you can view documents and images by tags, and you can add tags to documents and images as needed. Each document or image can have up to five tags. Why does Chrome freeze when uploading images? What are you doing with consent forms? Is it possible to Go Completely Paperless with Dentrix Ascend? An office can store up to 20 GB in the document manager without incurring an additional monthly charge.